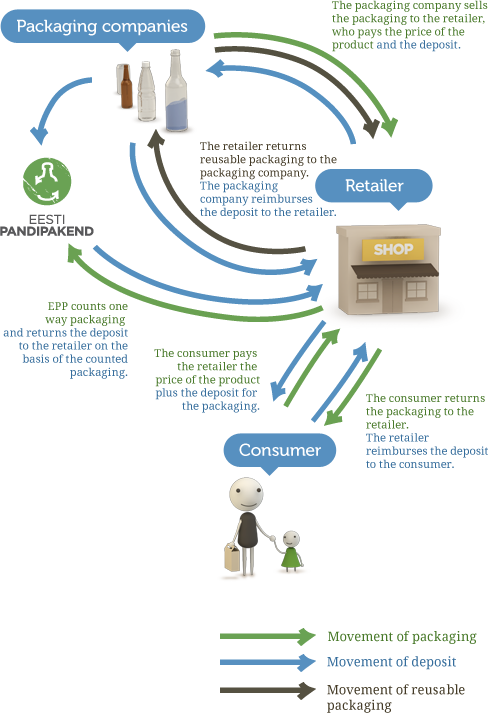 You are, if you sell goods packaged into deposit-subjected packagings to end users and end consumers and hand over the empty deposit-subjected packagings returned by end users and end consumers to the EPP. Why is a retailer required to accept packagings from consumers? Pursuant to § 20 of the Packaging Act, retailers are obliged to organise reception of deposit-subjected beverage packagings and refunding of deposit money to the consumers for the returned packagings. A retailer may delegate this obligation, but this does not relieve the retailer from responsibility before the consumer and the law. According to the law, the reception of deposit-subjected packagings and the refunding of deposits must be organised in a manner that is convenient and accessible for the consumers. There are two options for collecting packagings – with a machine or manually. To use a machine, the retailer must contact an EPP-approved seller of reverse vending machines; you can get all the necessary information about reverse vending machines from them. Contact data of EPP-approved sellers of reverse vending machines are HERE. Which packagings can be sent to EPP and which cannot? Packagings must be empty and sorted by materials, so that packagings made of different materials are collected into different collection bags. All packagings must have one of the deposit markings shown below. Refillable glass packaging with the marking must be sent directly to the producer according to their requirements.